This sign is for San Diego Bus Stop. The sign’s colors are yellow, blue and black. 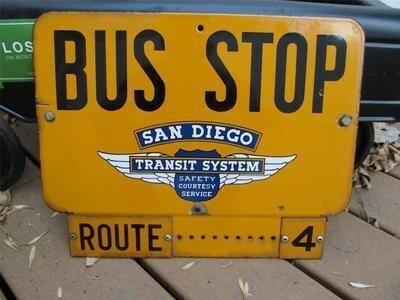 The text on the sign reads: Bus Stop San Diego Transit System Route 4. The sign shows a large die cut piece that has a shield with wings in the center and text above.